The sophisticated flavor of this low carb Chicken Moilee belies its ease of preparation, making it the perfect weeknight meal. This delicious gluten-free and dairy-free recipe uses fresh peppers, green chilies, ginger, garlic and lime in a rich coconut milk sauce. I remember the first time I had Indian food. I was twenty-two and in college. For Spring Break, my parents took me to England. I had the best time. We stayed in a Bed and Breakfast in an old brownstone. It was a residence and my parents had stayed there before on their first trip to England. Mrs. Louie was a gracious hostess and I felt very comfortable in my little room, which was just big enough for a twin bed, a chair, and a small wardrobe which housed a tiny television. My parents enjoyed a larger room on another floor and had the use of a living room as well. The house was quite charming and Mrs. Louie and her husband were very sweet. Mrs. Louie’s house was right near a main line for buses and the Tube, so traveling to destinations outside the city was very easy. It also made it convenient for dining out. I had some of the best Greek, Thai and Indian food I have ever had in my life, in England. Since I had never had Indian food before, my parents ordered for me and I was in love. I have no idea what they ordered. For all I know it could have even been Chicken Moilee; but whatever it was — it was great and I was hooked! I prepare Indian food quite frequently at home. I find it easy to prepare and always flavorful and satisfying. Often people say they do not like “curry” and I think they are speaking of the curry powder that can be purchased in the grocery store. 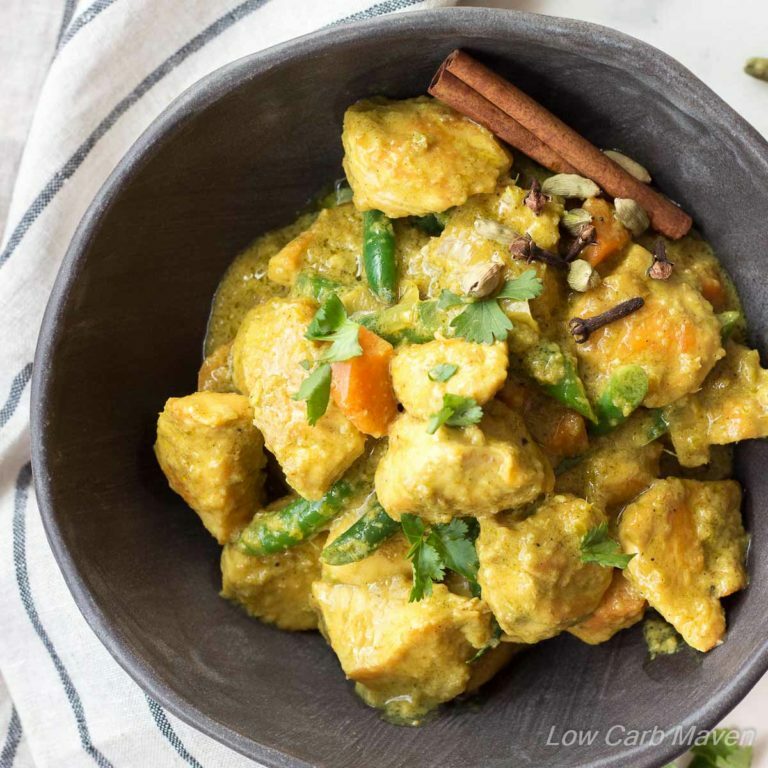 Real Indian Curries differ so greatly from each other in taste, ingredients, and texture, that to mix a bunch of spices together and call it “curry” is almost crazy. But, curry powder has its uses and I like it in my egg or chicken salads. 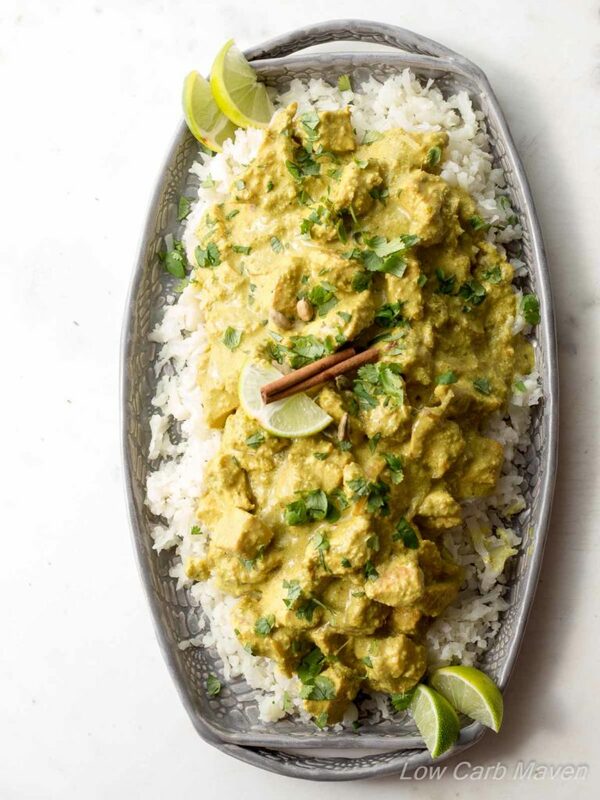 If you have not tried Indian food before, I hope you try this recipe for Chicken Moilee. I’ve tweaked the recipe to be served as a complete meal: protein and veggies together. This dish is great and my family loves it! 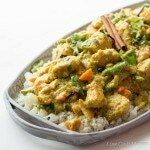 [NOTE] FOR A MORE TRADITIONAL CHICKEN MOILEE, LEAVE OUT THE GREEN BEANS AND CARROT. 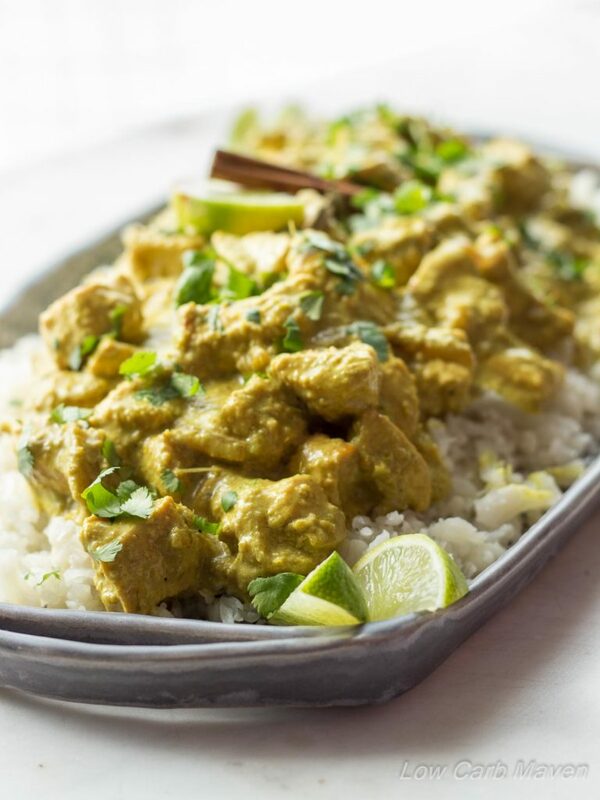 If you are looking for other fast but flavorful Indian Curry recipes, try this popular Bangalore Chicken Curry I made for WickedSpatula, the Hearty Beef Curry with Winter Vegetables, or the Indian Spiced Flank Steak with Cilantro Pistachio Pesto. Chicken Moliee is 9 net carbs for a whole dinner portion including the cauliflower rice. The sophisticated flavor of Chicken Moilee belies its ease of preparation. This delicious low carb recipe uses fresh green chilies, ginger, garlic and lime. Prep: Slice the onion into thin half rounds. Green beans and Carrots - Cut the green beans into 1 inch pieces and slice the carrot. Place the green beans and carrots into a microwaveable bowl with 1 tablespoon of water and cover with plastic wrap. Microwave for about 3 ½ minutes (depending on your microwave) and drain. Cauliflower - (You can do this step while the chicken is browning) If using frozen, thaw in the microwave for 5 minutes, squeeze excess water with your hands and grate in a food processor or on a box grater. If using fresh, grate first, then place into the microwave with 1 tablespoon of water and steam for 3-4 minutes. Chicken - Cut the chicken into bite sized pieces. Blender: De-seed and chop the peppers. Remove the skin of the ginger with a spoon and chop. Add the garlic and lime juice. Blend the ingredients until they are a smooth paste. Brown: In batches, brown the chicken in 2 tablespoon of ghee, over medium high heat, adding more ghee as needed. Remove chicken from pan and reserve. Cook: Add a little more ghee to the pan and fry the onion until soft and starting to brown. Add the spices and cook until fragrant. Add the puree from the blender, stir and cook until the raw smell of pepper mellows and the mixture loses it green color. This will take a few minutes. Add the coconut milk, stirring well, and let the mixture simmer over medium heat for five minutes or until it begins to thicken. Add the chicken and simmer gently for a few minutes to reheat. Add the green beans and carrots (if using) and heat through. Taste for seasoning and adjust. Serve Chicken Moilee over rice or cauliflower rice. Everything happens simultaneously, finishing at the same time, and is ready to serve in about 25 minutes. Don't forget to season the cauliflower with salt or the dish will be bland. I don’t see the ingredient amounts for green beans and carrots? If that is the worst mistake you’ve ever made on a recipe, then I think you’re doing well! Trying this tonight. I’ve already tried the Moroccan chicken and LOVED it! Thanks for what you do! When you say “don’t forget to season the cauliflower or it will be bland” what do you use to season it with? First of all, your parents sound AMAZING – that sounds like a memorable spring break! And second, WHY don’t I make Indian food more often? I’m going to fix that by trying this delectable chicken dish. Pinning! Wow! What a nice blog and recipes you have, Kim! I am enchanted by your food photography. This chicken dish is the type of meal that my family would eat with a huge smile on their faces. I had my first Indian food in England as well and I loved it so much, that when it was time for us to leave London and come back to Germany I bought myself 6 Indian cookbooks. I knew there would be no way to get that food around here. I love your recipe, I will give it a try soon.